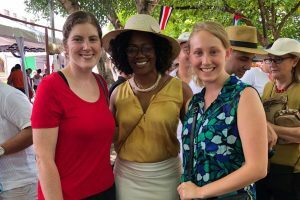 Taking Independence to a New Level Caroline Caruso '21 loved Costa Rica so much that she wants to open a medical practice there after graduate school. 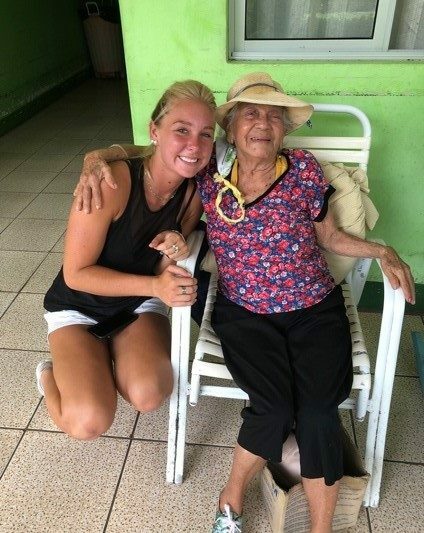 Caroline Caruso ’21 with a new friend in Costa Rica. What was your academic background and interest that led to this experience? As a biology and Spanish major, I wanted more firsthand practice with the language. I found out about the program through the Latin American and Caribbean Studies Program and signed up for LACS 452 – LACS Practicum, which is a 2-credit EXP course. 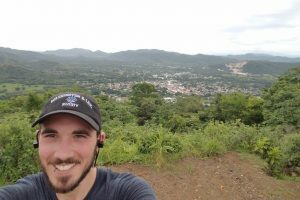 I planned to only spend a month living in Nicoya, Costa Rica, but I ended up changing my flight and staying for a little longer than expected. While I was in Nicoya, I attended Spanish class Monday through Friday from roughly 8 a.m. to 12 p.m. every day. Following class, I had a volunteer experience which varied from teaching English at a public school down the street, helping in the public library, to working at a retirement home. On the weekends I took advantage of the free time and traveled all around the western portion of the country. What was an average day like? As part of the program I volunteered at a local public school, where I taught English, and at a retirement home, where I kept the elderly company. I got to connect with the community on a deeper level and utilize both my Spanish and English skills to aid society. After a couple of hours volunteering, I would return to my homestay and enjoy coffee and a snack with Rebeca. We would have conversations about the day and she would give me a little advice on the places I should visit during my weekend. Around 7 p.m. I enjoyed dinner with my homestay family and often times would help Mariangel, Rebeca and Angel’s daughter, with some of her English homework. Did you meet anyone during the experience who became a mentor or an inspiration to you? Most of the people I met in Costa Rica were mentors and inspirations to me. Although I met such amazing people, my homestay mother, Rebeca, became such a mentor to me even after I returned to the United States. She is the most caring person I have ever met by far, and is essentially a second mother to me. She still messages me asking about my life and updating me on my family in Costa Rica. Not only does she work extremely hard at home, preparing meals and taking care of her family, but she also works with her husband and their bus company in Liberia. My professor, Priscilla, was also such a mentor to me. Fortunately, when I was there I was able to partake in a huge event in her life! She got engaged and I have never met someone who deserved it more. She has the bubbliest and most fun personality, and on top of that she is entirely selfless. She was always there for me whenever I needed anything during my stay and she often met me and Taylor Casey in Sámara for dinner to just spend extra time with us. What was the most challenging aspect of the job? The most challenging aspect of working at the public school was that children generally like to speak very fast, and for someone who is not yet fluent in Spanish it was very difficult for me to understand them. Luckily, they were understanding and spoke slower when I asked them to. I also never realized how difficult it was to teach a new language to someone else, especially when the letters of the Spanish alphabet make different sounds than the English alphabet. I often had to help teach them the alphabet before teaching them how to read and spell words in English. Overall, it was a challenging experience but it definitely was very rewarding to see the students progress in their studies of the English language. The most challenging aspect of working at the retirement home was also attempting to understand what the elderly were saying. Many of them had speech impediments or, due to the lack of teeth, it was difficult to determine what they were actually saying. It definitely took some adjusting but after I began to listen to them more cautiously, I was able to understand what they were saying. What else did you find fulfilling? The most fulfilling part of my experience was building relationships with the community of Nicoya, especially my host family. Even though my Spanish was nowhere near fluent by the end of my trip, I was able to have deep and enlightening conversations with my host family. The bonds I made with Rebeca and Mariangel are ones I would like to preserve for my entire life. I could not be more thankful to have met them and to have been a part of their family. While all of the volunteering I did was also very fulfilling, I think that the creation of those relationships, to this day, is the most fulfilling portion of my trip. What did you like best about the location? The best part of the location was that is was probably the least touristy city in the area. I got to speak Spanish exclusively and learn about culture in-depth. It was very obvious to me from the first day that the community in Nicoya is very focused on the family aspect of life and getting to know one’s neighbors. On my first day of classes, my homestay mother walked me to class, and every person we passed on the street knew her by name and stopped to have a short conversation with us. The city was extremely inclusive; while at first it was obvious that I was new, within the first week people started to greet me by name and have more conversations with me to get to know me. I thought the location was perfect because I got the true feel of the culture in a small Costa Rican city while being close to beaches and other typical sites for tourism like Monteverde and La Fortuna. What have you learned at W&L that helped you in this endeavor and what have you brought back to your life on campus? I think the Spanish classes I took definitely helped me with this endeavor. The vocabulary I had from taking Spanish for Healthcare Professionals and Spanish literature classes definitely progressed my ability to speak. I also believe that the independence that came along with attending Washington and Lee helped me have the courage to embark on this journey in the first place. I have always loved being independent but traveling to another country alone definitely took my independence to a whole other level. It is difficult for me to think about what I have brought back to my life on campus but something that is totally strange is that I have a newfound passion for Costa Rican foods. I purchased bags of empanada mix in order to make empanadas and bueñuelos to share with my family and friends. I also think this trip has just exemplified my passion for the Spanish language. Everywhere I go, I try to speak as much Spanish as I can; honestly, after traveling to Costa Rica I have been attempting to talk more even in English. The Costa Rican people are so welcoming and friendly that they like to try and get to know everyone in their community. I hope I can attempt to do that back on campus. Has this experience impacted your future plans in any way? This experience has definitely impacted my future plans. I fell so deeply in love with Costa Rica that I would love to return and start my own medical practice there following my completion of graduate school. I would also like to teach English in Costa Rica as soon as I can. I have traveled and lived in many foreign places but I have never been in an environment like Costa Rica. The way of life there is so pure that I do not think I will be able to keep myself from returning.